Home » Jobs » CA looking for BCBAs who like to look at the Big Picture! CA looking for BCBAs who like to look at the Big Picture! 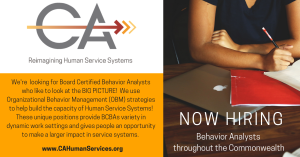 CA is looking for Board Certified Behavior Analysts who like to look at the BIG PICTURE! We use Organizational Behavior Management (OBM) strategies to help build the capacity of Human Service Systems! These unique positions provide BCBAs variety in dynamic work settings and gives people an opportunity to make a larger impact in service systems. Positions are available throughout Virginia!